Finally wait is over for iOS 7 Beta 4 Firmware because Apple has officially released its latest iOS 7 Beta 4 Firmwares (Build: 11A4435D) for iPad, iPhone and iPod Touch devices with newest software updates, improved performance issues, major bug fixes and provide better software compatibility and stability in iOS apps and games. If any Apple iDevice user is running an old iOS 7 beta firmware versions i.e. 3, 2, 1 than this update is must for them. Download iOS 7 Beta 4 IPSW Firmware for iPad 4, iPad 3, iPad 2, iPad Mini, iPhone 5, iPhone 4S, iPhone 4, iPod Touch 5G and Apple TV 3G/2G via Direct/Torrent Download Links available below. Official Apple iOS 7 Beta 4 Firmware (Build: 11A4435D) for iPhone, iPad and iPod Touch can also be download, install and upgrade via Over-the-Air (OTA) process by simply going to "Settings >> General >> Software Update" option on any iPad 4, iPad 3, iPad 2, iPad Mini, iPhone 5, iPhone 4S, iPhone 4, iPod Touch 5G and Apple TV 3G/2G devices. Apple iOS 7 developers can also download the iOS 7 Beta 4 IPSW via official iOS Dev Center website if they have Apple ID account. Apple iOS 7 Beta 4 Firmwares will be expired on September 12, 2013 Thursday. According to some un-official sources it’s expected that iOS 7 Beta 5 Firmware for iPad, iPhone and iPod Touch will be released and publicly available from August 12, 2013 Monday and after that Apple iOS 7 GM Firmwares (Gold Master, Final Build) will be released. So stay with us for more updates and news on Apple iOS 7 Firmwares. Download iOS 7 Beta 4 for Apple TV 2G - Uploading! Download iOS 7 Beta 4 for Apple TV 3G - Uploading! Download iOS 7 Beta 4 for Apple TV 3G (Rev A) - Uploading! 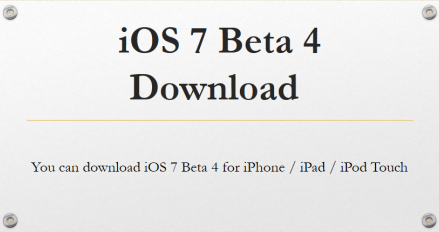 How to Download and Install iOS 7 Beta 4 Without Apple UDID or Developer Account? To officially download and install Apple iOS 7 Beta 4 Firmwares without having Apple UDID and Apple Developer account on iPad 4, iPad 3, iPad 2, iPad Mini, iPhone 5, iPhone 4S, iPhone 4, iPod Touch 5G and Apple TV 3G/2G devices, iDevice users will need to follow the tutorial and guide available HERE exclusively for our readers and users. Enjoy!